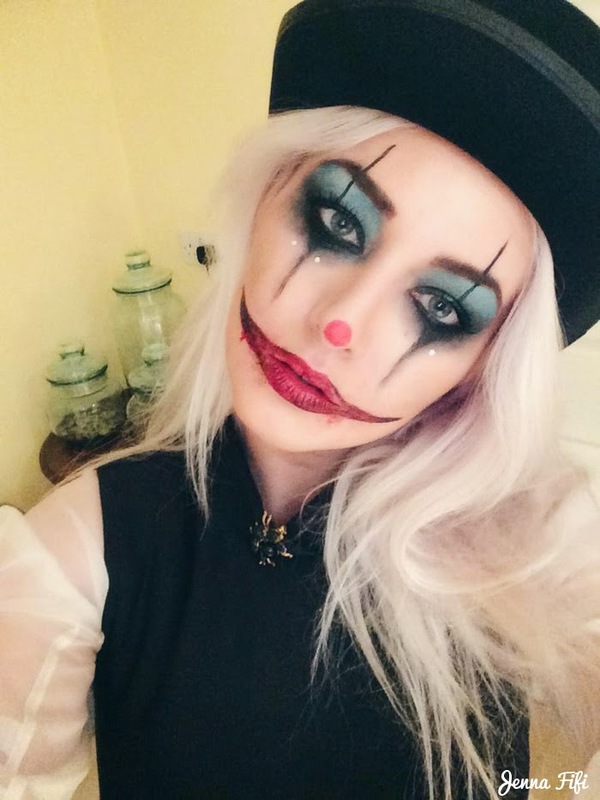 My costume for Halloween this year was inspired by unhinged clowns, bazaar circus performers and vintage freak show carnivals. 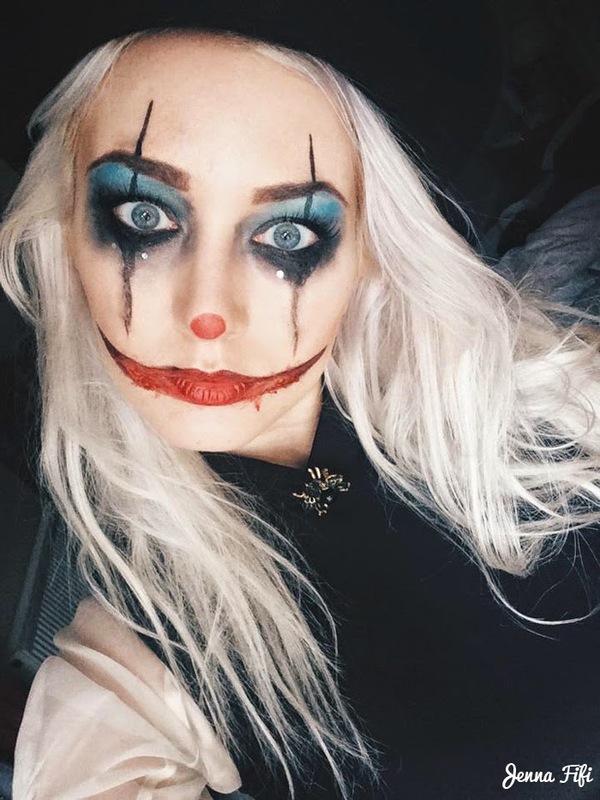 The makeup was surprisingly easy to do and I created it using basic makeup products that most people will have, aside from some fake blood which is a halloween staple anyway! I’ve tried to link as many of the items, so click on the item in the list of products to see more info on it. I’ve recently replaced my brushes to make sure they are all cruelty free and it has to be noted that the 100% vegan Urban Decay’s Good Karma brushes and Real Techniques brushes are all fantastic quality and I highly recommend them to all fellow animal lovers! Apply the foundation using a Real Techniques Buffing Brush, adding concealer under your eyes and over blemishes if needed, then blending it in with a beauty blender. Lightly brush on powder and then using a Real Techniques contour brush highlight your cheek bones and add contouring and blusher using the Sleek palette. With the lip marker, draw a small circle on your nose. The colour is surprisingly strong and I only had to draw it on once. First, draw in the eyebrows with an Urban Decay liner brush, using a darker shade then you would normally and making them more defined. You could always be even more creative with your brows for this look; I’ve seen some fantastical swirl brows. Using an eyeshadow brush apply Lancome’s ‘Best Dressed eyeshadow all over your eyelid, right up to the eyebrows. It’s best to add several layers so that the colour is bold and even. On your eyelids apply Nars ‘Night Breed’ and blend it into the blue with a blending brush. I used a patting motion around my eyes to add more of the Nars ‘Night Breed’ eyeshadow, blending it in further. Using the felt tip eyeliner draw a triangular shape underneath your eyes, don’t worry about being to neat here, further products are added so its just about getting the outline. Draw a thick, strong black line through your eyelid, eyebrow and then a little up your forehead coming to a point rather then a blunt stop. To create the lines below the eyes hold the liner much more lightly against your skin and allow the eyeliner to shake a little. This creates a far more ‘teary’ look. Using the Nars ‘Night Breed’ eyeshadow, repeatedly apply and then blend until the ‘tears’ look natural with uneven, patchy edges. Using a damp tissue or a wipe, dab the lower black line to make it more water streaked. It should resemble tear streaked makeup. The lip marker is perfect for this, as it doesn’t have a creamy texture that will rub off or smudge everywhere, instead it acts much like a felt tip staining the area for several hours. Draw in the outline of the extended smile with the lip marker, following the natural outline of your lips and filling in until the area is all the same colour. Then use the eyeliner again to darken the corners and add a thin outline, smudging it in as you go so it doesn’t leave a dark line. 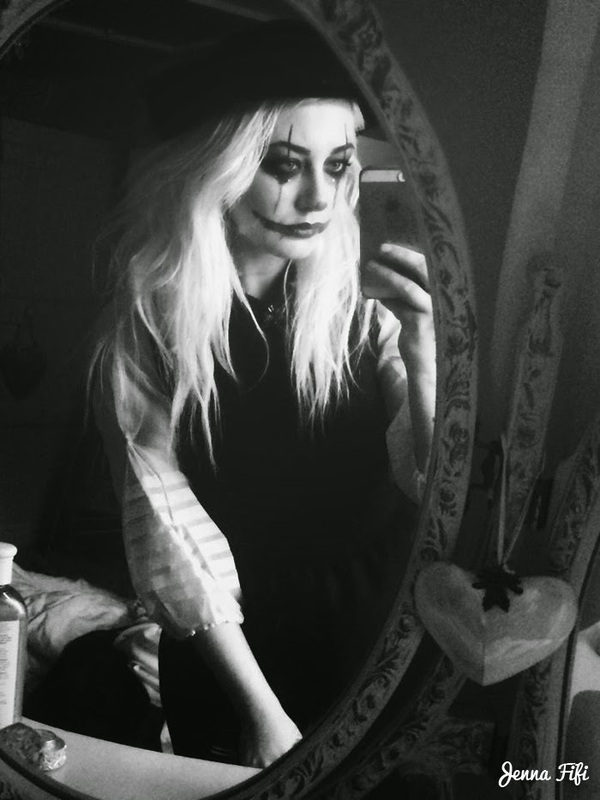 Finish my patting on some fake blood with your finger, allowing some to go outside of the drawn on smile. Ta-da, now you look like a freak show! Despite partying all night, most of the makeup stayed on and I only needed to reapply the lip marker once or twice. I applied Suqqu Frame Fix mist to secure the makeup which seemed to work! My hair doesn’t really warrant a tutorial, I simply back combed it and used a ton of hair spray until it looked like a complete mess! My costume was again very simple and I used most of my own garments. I had great fun getting out my old top hat and my beloved vintage crystal bug brooch, but I think the theatrical sleeves of the Tba blouse gave it a circus edge. My friends and I headed to my local pub in Somerset where there was plenty of dancing, merry making and ‘I didn’t recognise you’ greetings! 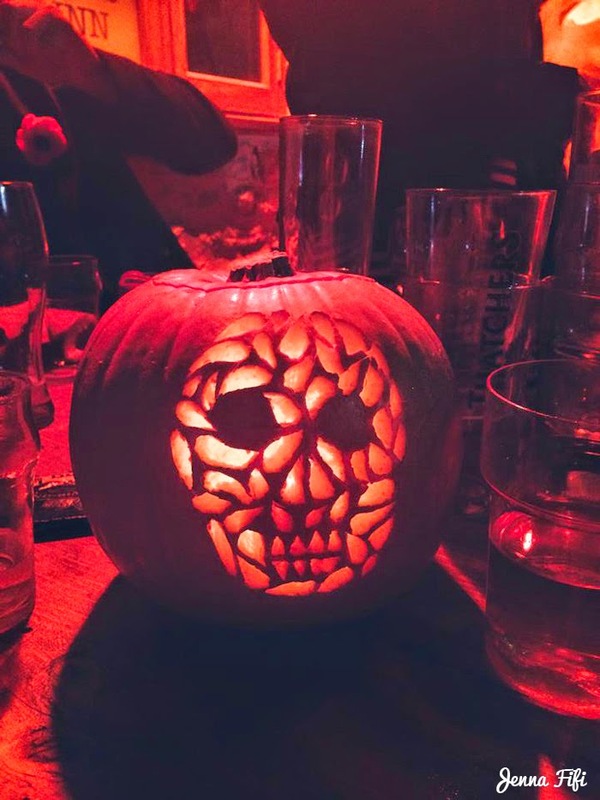 There was also a pumpkin competition and I think I did a pretty good job at carving this skull don’t you think? So much of Halloween is aimed at children but I can honestly say I’ve never enjoyed it so much. It’s been another haunting, bizarre and gruesomely brilliant year! What did you all dress up as? 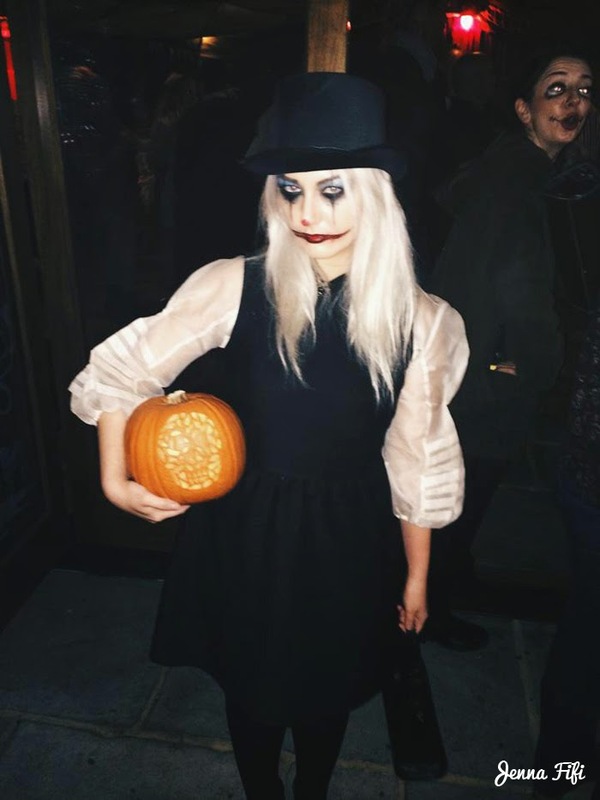 Oh my god this is one of the best halloween makeup looks I've seen yet aha! I couldn't do anything too crazy as I had to take my little cousins out to trick-or-treat and god knows they get scared enough from lawn decorations lol. 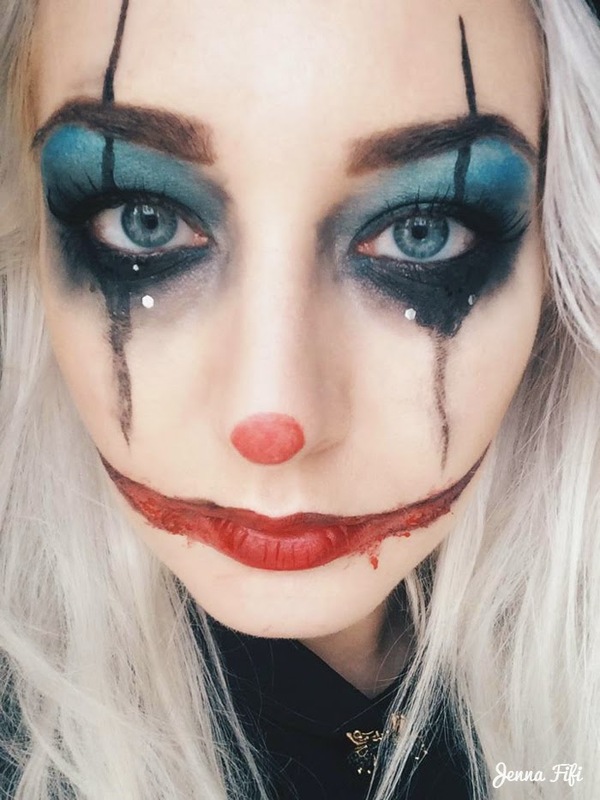 Absolutely incredible make up girl. Omg this looks so creepy, you did it so so well! Would you like to follow each toher via GFC? Let me know on my blog, I will follow right back! 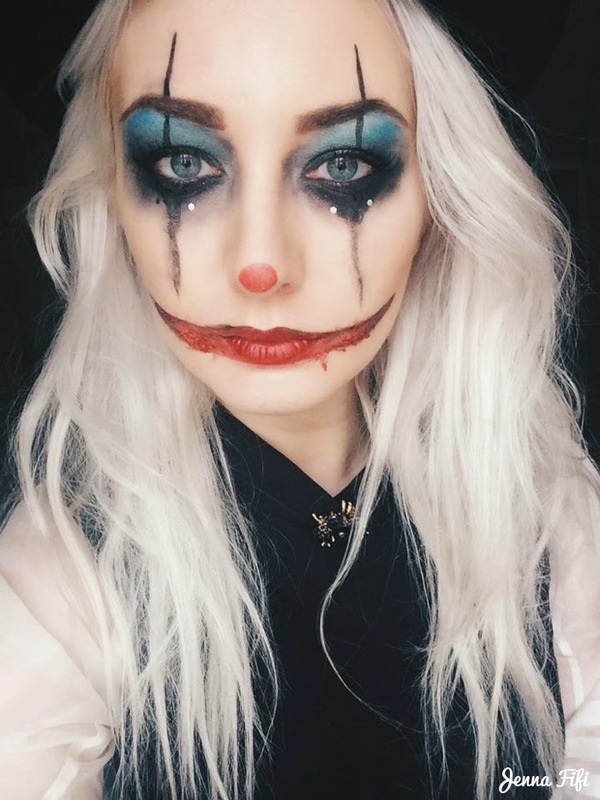 Great makeup look for halloween!